To the monumental relief of those who put up with me, my taper, under the auspices of the Hansons technique, has been pared from an ample 3 weeks to a willowy 10 days. I wonder how I’ll fare? Not just on race day. But in the next week and a half as well. Will my mind start to reel? Will I start climbing the walls with taper-induced anxious hyperactivity like I usually do? Or will I be more sedate? More zen. The taper not being long enough to extract my normal psychoses from their clever hiding places? And if that’s the case, is this a sign, a harbinger if you will, that my taper was not long enough? That I may be toeing the line on race day over-trained and under-rested? Or have the last few paragraphs proved positive enough that 5 hours into my taper I’m already a raving nut job? I guess we each tinker around to see what works best for us. How do you prepare for your races Paul? I ease off a little in the week before; generally after the long run on the Sunday. hey, let’s face it, all of us as runners are raving nut jobs – or at least that is the way non-runners look at us! My tapers vary. For my upcoming Ironman, it is a full 3 weeks. My work ours are getting ruthlessly slashed 21 days out and I can’t wait! Next week is my last peak training week. I did 23.5 hours this week and should reach 25-26 hours next week. I am planning about 13 hours taper week 1, 9 hours week 2, and 5 hours race week. For my half IM and my full marathon, the races were part of the training, so they each got a 1 week taper. The marathon was so-so (but I crushed my 10k PR the day before by 4:30), and I got a 52 minute PR on the HIM (with a PR in all three disciplines). 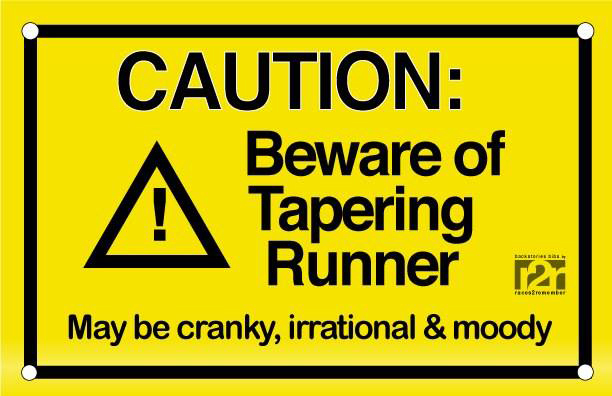 So, no, you don’t need a 3 week taper. But, I still take them for my big “A” races. I will do full tapers for Route 66, Houston, and Pittsburgh. It is part of the training cycle that I have learned to enjoy. Which race are you doing again? Hey Rod, is it the race this weekend? If so, good luck!!! Have a great race! Is there a way to track you? What is your PR at this distance and is there a time goal that you have in mind? I also thought that you disliked evening races. I this the race that you did last year that had some serious organizational issues? No matter what, sounds like you are ready to rock this race. Have a great time! Thanks Raymond! It is indeed the same race with the organizational issues but they’ve moved the course back to the original route so that should solve many of those problems. But you are correct. I am NOT an evening racer. I don’t eat after 5 p.m. as a general rule. This race starts at 5:30 p.m. The time that I will be finishing the race is usually when I’m popping out my contacts and flossing my teeth as I head to bed. And the forecast is calling for rainstorms and strong winds so this will be a bit of a challenge. I’ve checked with Sportstats online and it doesn’t look like this race is set up to be tracked. My PB is 2:30:39 with my personal CR at 2:34:03. But both times were set 2 years ago and I have not raced any times even close to that since that sophomore year of running.